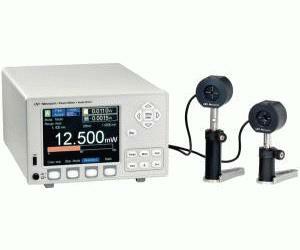 For applications requiring measurement of low-power light sources, Newport models 1931-C/2931-C instruments have broken the barrier of temporal measurement performance with calibrated results. This series of power/energy meters have the ability to handle repetition-rates of up to 20 kHz at a sampling rate of 250 kHz. Peak-to-peak and DC source measurements can be displayed in units of W, dBm, dB, and A. Simultaneous measurements of a variety of light sources operating at different power levels and wavelengths can be performed with our Dual-Channel 2931-C Optical Power Meter. Low-power measurements, of pW to tens of Watts can be accomplished with any one of the Newport 918D Series Silicon (Si), Germanium (Ge) or Indium Gallium Arsenide (InGaAs) Detectors, covering 190–1800 nm wavelengths. All 918D Series Detectors have a built-in temperature sensor utilized for sensing, and active compensation of temperature-induced measurement fluctuations. Advanced features include a 250,000 data point storage buffer, analog and digital filtering, programmable sample rates, moving statistics, plotting and multiple user-configuration storage. Users can select from 6 display colors to match their specific lighting conditions and colors of their laser safety eyewear. Measurements can also be displayed in various display formats, such as numeric, graphic, bar and strip charts.